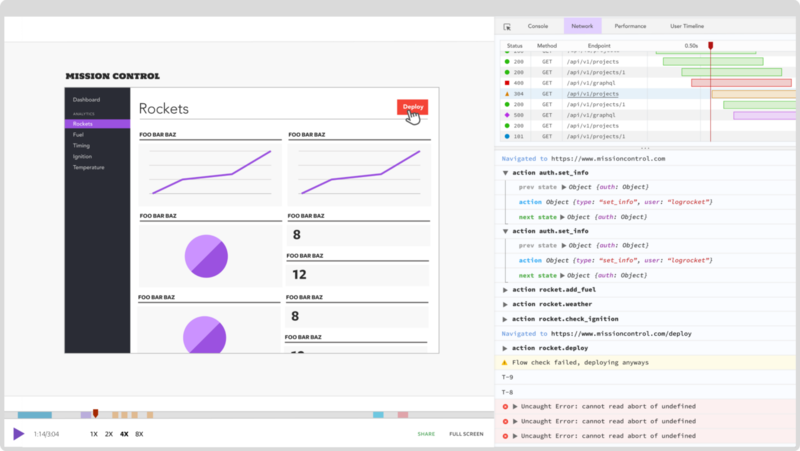 Redux is a great tool that solves one of the main problems of UI frameworks: state management. State management on the client side can quickly grow into a nightmare, and the unidirectional flow of data Redux enforces makes it easy to understand how events alter the state of your application. Sadly, state management is just one of the many issues you have to deal with while building robust applications. What about handling side effects (like network requests, the most common)? Redux, by itself, doesn’t provide a solution out of the box. Fortunately, the community has a good number of libraries maintained to solve the problem. Now, just which of these is right for your project? The truth is that each of these solutions were built with different approaches, use cases, and mental models in mind. I don’t intend to discuss all of the possible approaches, but let’s have a look at some of the most common patterns with a simple application. Take a look at the application screenshot above. It’s arguably very simple. There’s a bunch of text and a medium clap icon to the left. You may grab the Github repo for this app. Note that the Medium clap is clickable. Here’s how I built the medium clap clone in case that fascinates you. 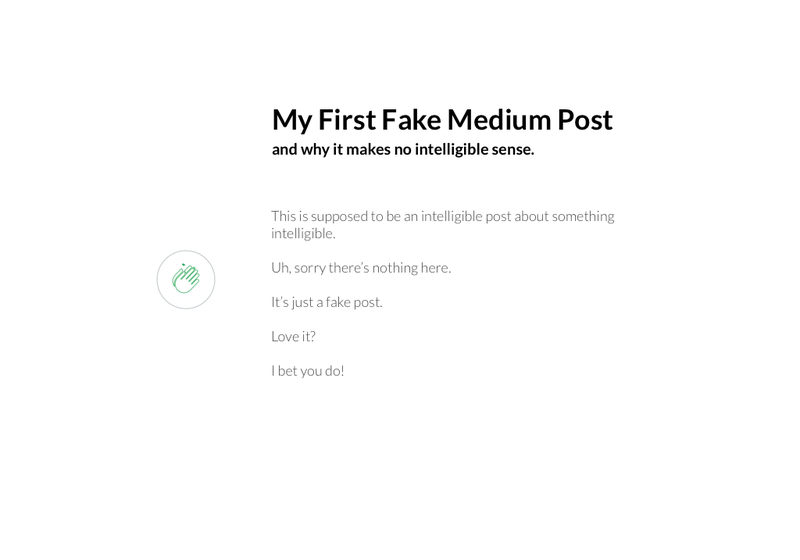 "text": "This is supposed to be an intelligible post about something intelligible." "text": "Uh, sorry there’s nothing here." "text": "It’s just a fake post." "text": "I bet you do!" Where StyledArticle is a regular div element styled via the CSS-in-JS solution, styled-components . It doesn’t matter if you’re familiar with any CSS in JS solutions. StyledArticle could be replaced with a div styled via good ol’ CSS. The medium clap component is exported within this directory. The code is slightly more involved and beyond the scope of this article. 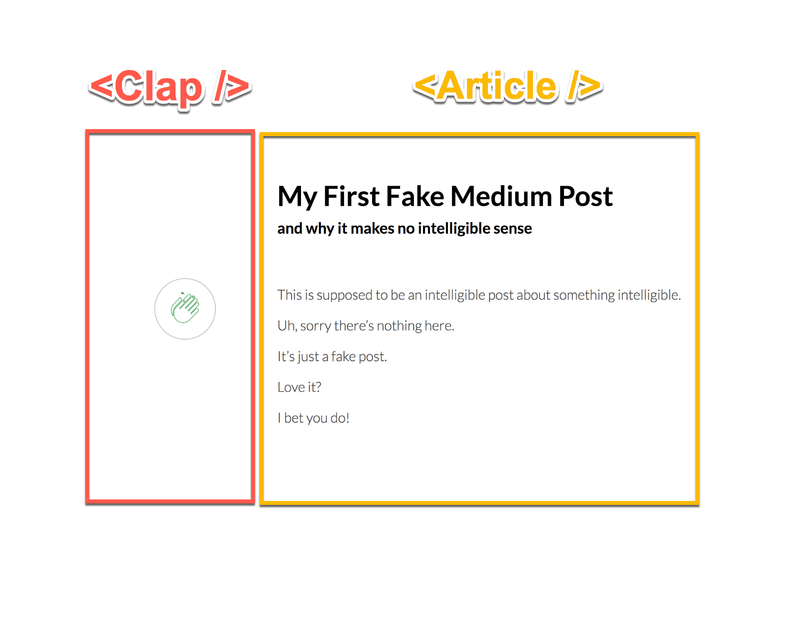 However, you can read up on how I built the medium clap — it’s a 5 minute read. Again, you could replace StyledApp with a regular div and style it via CSS. Now, to the meat of this article. Let’s have a look at some of the different ways you could chose to fetch data in your Redux app, and also consider their pros and cons. The most popular options are arguably, redux-thunk and redux-saga. One of the most important things to remember is that every third-party library has its learning curve and potential scalability issues. Of all the community libraries for managing side effects in Redux, those that work like Redux-thunk and Redux-promise are the easiest to get started with. For redux-thunk, you write an action creator that doesn’t “create” an object but returns a function. This function gets passed the getState and dispatch functions from Redux. Let’s have a look at how the fake medium app may utilise the redux-thunk library. To make the library work as expected, it has to be applied as middleware. The first line in the code block above imports the createStore and applyMiddleware functions from redux. Line 2 imports the thunk from redux-thunk . Line 3 creates the store but with an applied middleware. Now, we are ready to make an actual network request. I’ll be making use of axios library for making network requests but be free to replace that with any http client of your choice. The article details have been successfully fetched from the server. With that, the details of the article has been fetched and displayed in the app. What exactly is wrong with this approach? If you’re building a very small application, redux-thunk solves the problem and it’s perhaps the easiest to get along with. However, the ease of use does come at a cost. Let’s consider three drawbacks. 1. Every action creator will have repetitive functionality for handling errors and setting headers. In most applications, you’ll need to make multiple requests and in different methods, GET, POST etc. Oh, and if you wanted to fetch a user’s profile ? It doesn’t take long to see that there’s a lot of repeated functionality. And if you wanted to catch errors, you’d add a catch block to every action creator ? 2. With more async action creators, testing gets harder. Async stuff is generally harder to test. Not impossible or difficult to test, it just makes it considerably harder to test. Keeping action creators as stateless as possible, and making them simple functions makes them easier to debug and test. With more action creators you include in your application, testing gets harder. 3. Changing the server communication strategy gets even harder. What if a new senior developer came around and decided the team had to move from axios to another http client, say, superagent . Now, you’d have to go change it the different (multiple) action creators. These are slightly more complicated than redux-thunk or redux-promise. redux -saga and redux-observable definitely scale better, but they require a learning curve. Concepts like sagas and RxJS have to be learned, and depending on how much experience the engineers working on the team have, this may be a challenge. 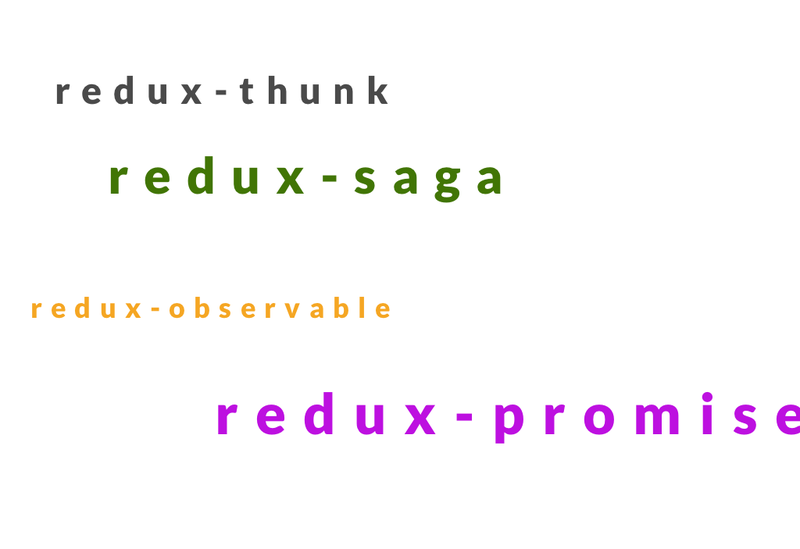 So, if redux-thunk and redux-promise are too simple for your project, and redux-saga and redux-observable will introduce a layer of complexity you want to abstract from your team, where do you turn? Most solutions like redux-thunk, redux-promise and redux-saga use a middleware under the hood anyway. Why can’t you create yours? While reinventing the wheel does sound outrightly like a bad thing, give it a chance. A lot of companies already build custom solutions to fit their needs anyway. In fact, that’s how a lot of open source projects began. So, what would you expect from this custom solution ? A centralised solution i.e in one module. Supports custom error handling e.g. to be sent to some external logging service, or for handling authorisation errors. Again, depending on your specific needs, you may have a larger list. Now, let me walk you through a decent starting point. One you can adapt for your specific use case. And, here’s the full-fledged code for the custom api middleware. It may look like a lot at first, but I’ll explain every line shortly. const dataOrParams = ["GET", "DELETE"].includes(method) ? With barely 100 lines of code, which you can grab from GitHub, you have a customised solution with a flow that is easy to reason about. First, you make some important imports, and you’ll get to see the usage of those very soon. The next line after the imports fetches the BASEURL from some environment variable. Depending on your set up, the way you fetch environment variables might slightly differ. Here I’m using the default way to do so in a react app. Why extract the base url anyway? It makes a lot of sense to ONLY have specific endpoints in your action creators as opposed to full URLS. Not hardcoding this value makes for a lot more flexibility and ease of change in the future. 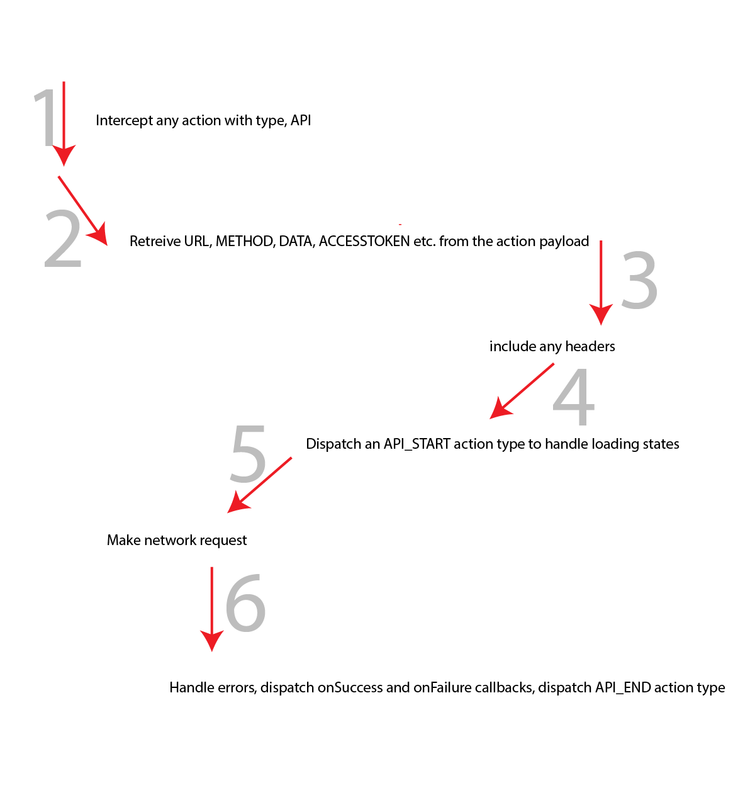 The condition above is important to prevent any action except those of type, API from triggering a network request. In order to make a successful request, there’s the need to extract the following from the action payload. url represents the endpoint to be hit, method refers to the HTTP method of the request, data refers to any data to be sent to the server or query parameter, in the case of a GET or DELETE request, accessToken refers to an authorisation token, incase your app includes an authorisation layer, onSuccess and onFailure represent any action creators you’ll like to dispatch upon successful or failed request, label refers to a string representation of the request and lastly, headersOverride represents any custom headers to overrde any defaults. You’ll see these used in a practical example shortly. Because this solution uses axios, and I think most HTTP clients work like this anyway, GET and DELETE methods use params while other methods may require sending some data to the server. Thus, the variable, dataOrParams will hold any of the values, params or data depending on the method of the request. If you have some experience developing on the web, this should not be strange. Most decent applications will have some authorisation layer. This is a good place to populate an headers object with any special headers in the action payload, and also set defaults e.g the Authorization header as seen above. The second conditional represents a bit of an edge case i.e a situation where you need to override some headers in a certain request. Just include a headersOverride field to the action payload and that will be taken care of as well. A label is just a string to identify a certain network request action. Just like an action’s type. If a label exists, the middleware will dispatch an apiStart action creator. The action type is APISTART. Now, within your reducers you can handle this action type, to know when a request begins. I’ll show an example shortly. Also, upon a successful or failed network request, an APIEND action will also be dispatched. This is perfect for handling loading states since you know exactly when the request begins and ends. Again, I’ll show an example shortly. It isn’t as complex as it looks. axios.request is responsible for making the network request, with an object configuration passed in. This includes the url, method, headers , and a data or params field depending on whether the request is a GET, DELETE request or not. These are the variables you extracted from the action payload earlier. Upon a successful request, as seen in the then block, dispatch an apiEnd action creator. Within your reducer, you can listen for this and kill off any loading states as the request has ended. After that is done, dispatch the onSuccess callback. The onSuccess callback returns whatever action you’d love to dispatch after the network request is successful. There’s almost always a case for dispatching an action after a successful network request e.g to save the fetched data to the redux store. You may have another middleware that listens for this action type and makes sure it the error hits your external logging service. You dispatch an onFailure callback as well. Just incase you need to show some visual feedback to the user. This also works for toast notifications. In this example, I dispatch an accessDenied action creator which takes in the location the user was on. I can then handle this accessDenied action in another middleware. You really don’t have to handle these in another middleware. They can be done within the same code block, however, for careful abstraction, it may make more sense for your project to have these concerns separated. And then edit the fetchArticleDetails action to return a plain object. Note how the payload from fetchArticleDetails contains all the needed information required by the middleware. Once you go beyond one action creator, it becomes a pain to write the payload object every single time. Especially when some of the values are null or have some default values. Using ES6 default parameters, note how apiAction has some sensible defaults already set. And the result is the same, a working application! To see how labels can be useful for loading states, I’ll go ahead and handle the APISTART and APIEND action types within the reducer. Based on that I can set up a loading state within the App component. See the “loading ….” text ? Remember, the custom middleware I’ve shared here is only to serve as a good starting point for your application. Evaluate to be sure this is right for your exact situations. You may need a few tweaks depending on your specific use case. For what it’s worth, I have used this as a starting point on fairly large projects without regretting the decision. I definitely encourage you to try out the various available options for making network requests in a redux app before committing to any. Sadly, it becomes difficult to refactor after choosing a strategy for a grown application. In the end, it’s your team, your application, your time, and ultimately, you alone can make the choice for yourself. Do not forget to check out the code repository on Github.